What do you get when you have some of the greatest tennis players that have ever surfaced this planet, some of the biggest, singing sensations and a celebration for the wonderful sport of tennis all together under one roof? You get the renowned, the prestigious, and the spectacular… Arthur Ashe Kids’ Day! Year after year, the sensational Arthur Ashe Kids’ Day puts together one of the greatest events people will ever be able to experience. The Arthur Ashe Kids’ Day celebrates the tennis hero, Arthur Ashe who is known for being one of the best tennis players in the United States and an individual who has inspired others to follow after their dreams, whether it be playing a sport or anything a person hopes to accomplish in life; and Arthur Ashe is an individual who has influenced the sport of tennis greatly. Celebrating the kick-off of the remarkable US Open brings the Arthur Ashe Kids’ Day which was held this year on August 29, 2015. This year at the 2015 Arthur Ashe Kids’ Day, the event brought together some of the biggest, most sensational musical acts including Jacob Whitesides, Kalin and Myles, Bea Miller, Natalie La Rose, and American Authors. People got up and got active as they watched the Arthur Ashe Kids’ Day event take place and be hosted by fitness guru: Shaun T, who even got some of your favorite tennis players doing some dance moves. Radio Disney’s Brooke Taylor also helped host the event with the phenomenal Alex Angelo getting everyone even more pumped for this extraordinary event with his indescribable DJ-ing skills! At the HESS Festival stage, Forever In Your Mind, Sweet Suspense, Alessia Cara, Jena Rose Raphael and Carson Lueders performed. In addition to the wonderful musical performances, tennis history was made yet again with this phenomenal event as tennis legends: Rafael Nadal, Roger Federer, Serena Williams and Novak Djokovic took on the tennis court and were put to some tennis challenges. Not everyday do you get to see four of the most sensational, accomplished, tennis heroes put together on one court exhibiting their indescribable talent. The challenges that each of these tennis greats took on led to proceeds being donated to their specific charities. Queen of the court: Serena Williams, one of the best tennis players of all time: Novak Djokovic, “The King of Clay”: Rafael Nadal and tennis phenomenon: Roger Federer together made something in the air feel a lot more special – what a legendary day to kick-off another legendary year of the US Open! 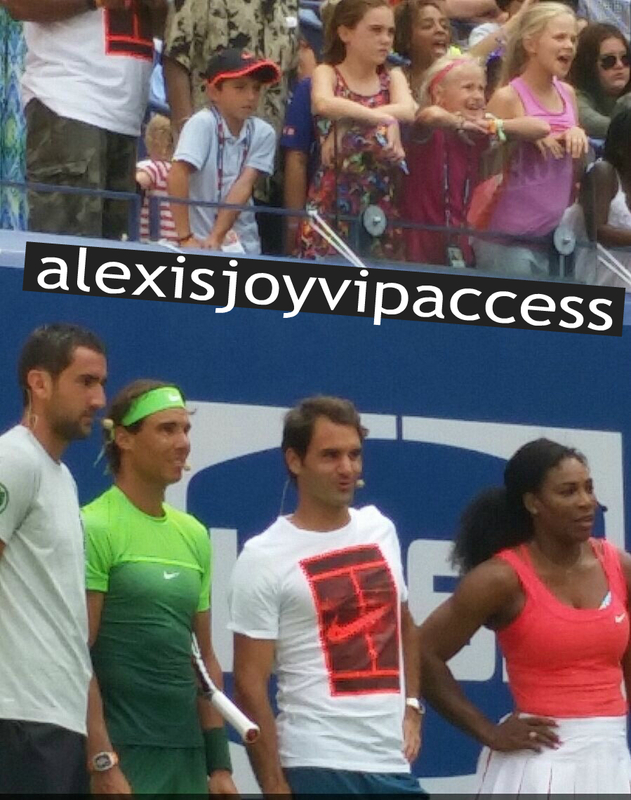 I, Alexisjoyvipaccess had the utmost and incredible honor of covering the 2015 Arthur Ashe Kids’ Day! At the event, I had the great pleasure of interviewing sensations: Jacob Whitesides and Kalin and Myles and even had the extraordinary opportunity to sit court side and watch the amazing Arthur Ashe Kids’ Day show including seeing Serena Williams, Rafael Nadal, Roger Federer and Novak Djokovic only a few feet away from me – talk about a tennis lovers’ dream! The Arthur Ashe Kids’ Day event is one of the greatest events for families to attend – it celebrates tennis and the idea of getting up and getting active plus it brings some outstanding musical performers and of course, tennis legends! What more can anyone ask for – the Arthur Ashe Kids’ Day is one perfect event! Check out my VIPAccessEXCLUSIVE interviews with Jacob Whitesides and Kalin and Myles at the 2015 Arthur Ashe Kids’ Day on YouTube.com/alexisjoyvipaccess and check out some VIPAccessEXCLUSIVE photos I took during my coverage of the 2015 Arthur Ashe Kids’ Day below! Thanks for having me cover the event, Arthur Ashe Kids’ Day! Follow the Arthur Ashe Kids’ Day on Twitter: @AAKidsDay and use #AAKD to stay in the loop! Previous VIPAccessEXCLUSIVE: Singing Phenomenon Jacob Whitesides Interview With Alexisjoyvipaccess At The Arthur Ashe Kids’ Day! Next Article: Which Nickelodeon Cast Was Up On The Jumbo Screen At The LA Sparks Game? Find Out Here! W🎾W! Impressive coverage of AAKD/2015 US Open& having that awesome chance to be seated center at the court side& seeing the Tennis Greats in person & so with your interviews with some the music entertainers. More power & lookin forward to more of your exciting articles .